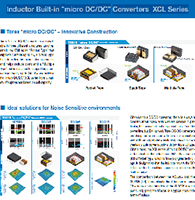 As a Torex Semiconductor’s distributor, NAC offers Torex’s full offering of Power ICs, Voltage Regulators, Temperature & Magnetic Sensors. Torex is an analog CMOS professional group that specializes in power ICs. TOREX SEMICONDUCTOR LTD was registered and founded in Okayama Japan Head office established in Tokyo in March, 1995.Torex responded quickly to the development needs of electronic devices, which never ceased to become smaller and lighter. The size may be ultra-small, but the impact is unlimited. From familiar mobile devices such as smartphones, digital cameras and computers, to in-vehicle systems such as car navigation, ETC in-vehicle devices and power windows, and even industrial equipment such as robots, the performance of Torex’s products have a reputation for excellence in every field.